The MeSMV ImmunoStrip® is an on-site tool to quickly detect all strains of Melon severe mosaic virus in foliar tissue of melon, watermelon, squash, cucumber and pumpkin. The MeSMV ImmunoStrip® test is an ideal screening tool for resistant genotypes, field inspection of seed crops, scouting, and disease diagnosing in general. The test requires no equipment or expertise to run. 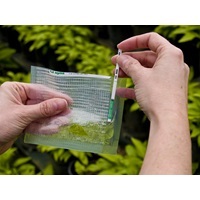 Results are obtained in as little as a few minutes making them perfect for use in the field or greenhouse. The ImmunoStrip® is specific to MeSMV and does not cross-react with other viruses that may infect cucurbits, such as: Cucumber mosaic virus - CMV, Papaya ringspot virus - PRSV, Squash mosaic virus - SqMV, Watermelon mosaic virus - WMV, Watermelon silver mottle virus - WSMoV, Zucchini lethal chlorosis virus - ZLCV, Zucchini yellow mosaic virus - ZYMV, Capsicum chlorosis virus - CaCV, Groundnut ringspot virus - GRSV, Impatiens necrotic spot virus - INSV, Tomato chlorotic spot virus - TCSV, Tobacco mosaic virus - TMV, Tomato mosaic virus - ToMV, Tomato ringspot virus - ToRSV, Tobacco ringspot virus - TRSV, and Tomato spotted wilt virus -TSWV.